GMB, the union for security staff, has hit out at a ‘big brother’ company for forcing workers to download spying software to their personal mobile phones. Churchill Security has written to employees saying they are ‘expected’ to use the application which will ‘track locations’ and ‘update you of shift changes’. This is appalling behaviour from a company trying to play big brother to hard working security guards. 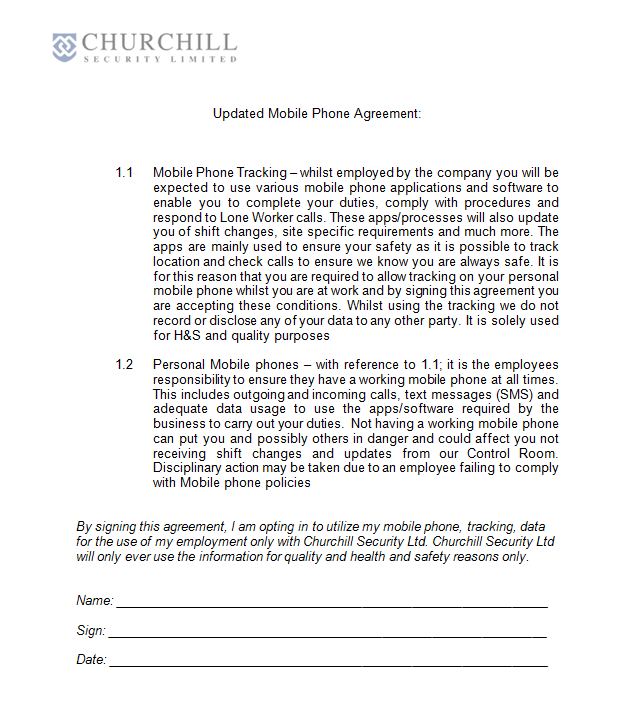 The letter adds ‘it is the employees responsibility to ensure they have a working mobile phone at all times…disciplinary action may be taken due to an employee failing to comply with mobile phone policies’. Churchill, based in Chorley, employs more than 160 people in across the UK, including in Cardiff Bay, Cheltenham, Watford, Milton Keynes, Bromley, Abingdon and London. “Our members are performing a difficult, dangerous job with enormous responsibility. “These are the people we rely on, the first on the scene after atrocities like Westminster Bridge or the Manchester Arena.